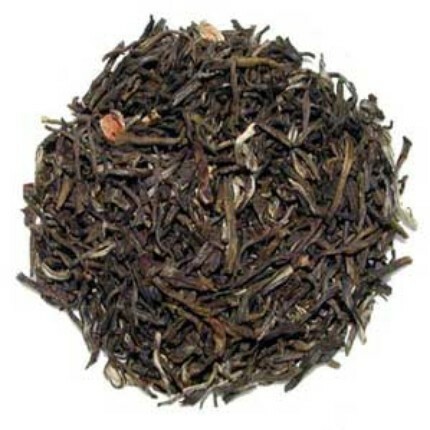 Pouchong tea is a type of oolong closer to a green tea than a typical oolong. 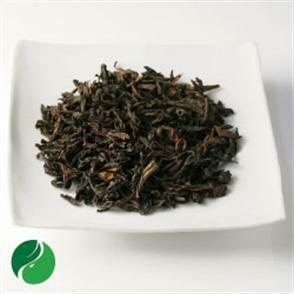 This is due to Pouchong tea being oxidized 15% or less while most Oolongs are oxidized about 30-70%. Pouchong means “the wrapped kind”, referring to the practice of wrapping the leaves in paper during the oxidation process. Our Pouchong brews a golden green liquor with mild sweetness and delicate floral notes. It has a smooth flavor, making it a perfect everyday tea. There are people who would consider this to be a green tea, while others would consider it to be an Oolong. As for me, I consider this to be neither. I think that Pouchong teas deserve to be in a class all by themselves. This Pouchong from Drink T is outstanding. It possesses a beautiful floral quality that is quite strong and even a little sharp. The flavor is also sweet and buttery, with hints of vegetation. The mouthfeel of this tea is extraordinary. It is smooth and silky, and because there is very little astringency to this tea, there is nothing that stands in the way of that smooth silkiness lingering upon the palate long after the sip. It’s very enjoyable. This is an incredibly relaxing cup. It has a pleasant sweetness and needs no additions. I prefer it hot, but it is quite refreshing chilled too. A perfectly delightful cuppa! Pouchong green tea from Fuzhou, China, scented with jasmine petals. This jasmine is a little different from a typical jasmine green tea, because the leaves are Pouchong. Pouchong teas are sometimes classified as green tea, but, they are actually an Oolong tea, because they are lightly oxidized. I usually classify a Pouchong as separate from both green and Oolong teas, because even though it is “technically” an Oolong tea, it isn’t a typical Oolong. I like the differences that the Pouchong tea brings to this cup. The flavor is smoother and richer. There is very little vegetative flavor, instead, there is a light nutty background that offers an interesting contrast to the sweet jasmine flavor. This has a nice floral taste, but is less sharp than what I might experience with a jasmine green. This tea is delicious served hot or iced. If you choose to serve it iced, I do recommend adding a small amount of sweetener to punch up the flavor a bit, but, if consumed hot, it doesn’t need sweetener, it has a beautiful flavor without it. Of course, if you prefer a sweeter tea, I would recommend a drizzle of honey with this one. I like the way honey compliments jasmine! 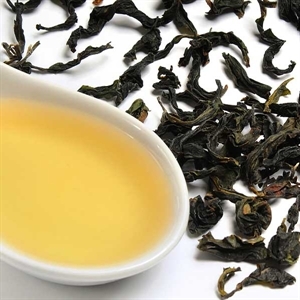 A lightly oxidized oolong tea with a subtle, sweet aroma and complex flavor. This is a sample that I received with a recent order from Tavalon. Quite smart on Tavalon’s part – luring me in to yet another tea that I love! You might be wondering what a Pouchong tea is. It’s actually an Oolong, but I like to make the distinction between Pouchong vs. Oolong because, even though this is an Oolong tea, it has some significant differences in taste from, say, a greener Oolong or even a dark Oolong. I have often heard that Pouchong is somewhere between green tea and Oolong tea, and I would agree with that assessment. I have really enjoyed the Pouchong teas that I’ve tried and this Grand Pouchong from Tavalon is no exception: it is absolutely delightful. It has a roasted nut flavor to it that is sweet and even lightly caramel-y. Toasty! There is a distant fruit-like flavor that vaguely resembles one might get if they were to cross a peach and a cantaloupe! There are also hints of flower in the taste – honeysuckle, perhaps? It is truly an intriguing, complex cup that keeps me sipping to see what else I might uncover in the layers of flavor. I prefer Pouchong teas served hot, and this is generally true for most teas that I would categorize as complex, because those complexities are more distinguishable when the tea is hot. As the tea cools, some of the complex nuances of the tea tends to become muted as a result of the chilling process. So, when you really want to enjoy a tea for its many layers of flavor, drink it hot. When you’re looking for cool, thirst-quenching refreshment, drink it iced! This has a natural sweetness to it that I compared to caramel – and it does! So, I do recommend tasting it before you sweeten it. Sweetener, in my opinion, would really overwhelm this tea. Enjoy it in it’s pristine perfection! 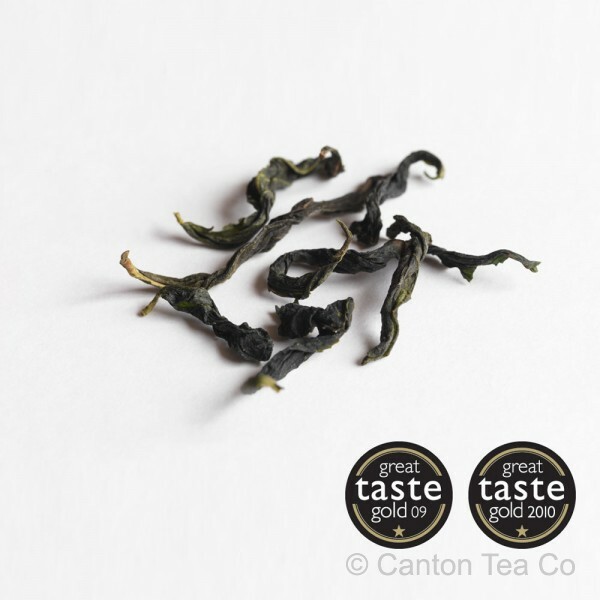 For the second year running, our exclusive Pouchong from Taiwan took a gold award at the Guild of Fine Food Great Taste Awards. This is one of our favourite teas and completely exclusive to Canton Tea Co. Grown high on the slopes of WenShan, Taipei county, by farmer Xu and his family, this award-winning Pouchong is incredibly light and refreshing with smooth floral notes and a sweet apricot finish. The locals call it a green tea, but it is actually a very lightly oxidised oolong. The big twisted leaves produce a bright yellow/green liquor that is creamy soft and delicious. This is an extremely tasty Pouchong variety. It has a light-to-medium body with a creamy texture (or mouthfeel) to it that is similar to the texture of whole milk. The aroma of the tea is faintly vegetative with hints of floral notes. The notes of vegetable and flower translate to the brewed cup – with stronger floral flavors than the vegetative notes which linger in the background. There is even the slightest hint of a buttery flavor, not strong, but it is complementary to the vegetal note. Particularly nice is the aftertaste – this tea imparts a delightful fruit-like taste on the tongue… the company description suggests it’s a sweet apricot flavor and I’m inclined to agree, it is quite apricot-y. Overall the flavor of this cup is delicate, but extraordinary. I recommend brewing it in a gaiwan to extract the most you can out of these leaves, and they’re ready for quite a few infusions – I managed seven infusions from the same measurement of leaves in my gaiwan!